Black Widow, Hawkeye, Nick Fury. Even Iron Man and Thor. There was a time when most people had never heard of them. They’re household names now, thanks to Hollywood’s insatiable appetite for comic book movies. Audiences can’t get enough of them, and stories that were once the sole domain of kids reading under the covers by flashlight and nerds hoarding slim, colorful volumes in boxes under the bed have become entertainment for the masses. This summer will be a major one for comic book aficionados with three anticipated adaptations headed for the big screen. The season kicks off Friday with “Avengers: Age of Ultron,” sequel to “The Avengers,” the third highest grossing movie of all time. Late summer will usher in “Ant-Man” (in theaters July 17), starring Paul Rudd as the insect-sized superhero, and a reboot of Marvel’s “Fantastic Four” (Aug. 7). It’s fitting that 24 hours after the debut of “Age of Ultron,” shops around the country will observe Free Comic Book Day, a celebration of the genre that gave us The Hulk, Captain America, Thor, Iron Man and other memorable characters in the film franchise. 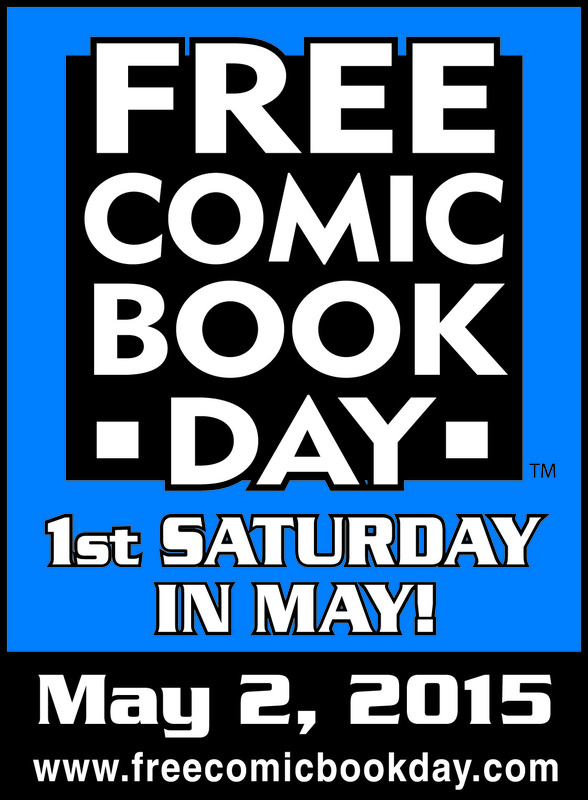 Launched in 2002 by Diamond Comic Distributors and a panel of industry retailers, publishers and suppliers, Free Comic Book Day is held annually the first Saturday in May. The goal of the event is to introduce readers unfamiliar with comic books to this unique literary format and their local independent comic book shop. “Each (shop) is unique in its community, with a style and personality all its own,” according to www.freecomicbookday.com. I’ve never been much of a comic book reader. I remember thumbing through my older brothers’ issues of Archie and Superman, but I never really got hooked on the genre. Still, with my love of fantasy, reading and stories, I’ve always felt a kinship with comic book enthusiasts. The comic book store is one of my favorite places to hang out. As an entertainment reporter, I frequented one Lancaster shop — Bases Cards and Comics — for more than a decade. I first visited the store in 2000. It was the year of “X-Men,” when comic book movies became more than just kids stuff, and I was looking for quotes from fans who were already familiar with the mutant heroes. The readers browsing at the shop that Wednesday morning were eager to talk about why they loved the X-Men. I found them to be warm, engaging and surprisingly articulate with good things to say about the history and social relevance of the Marvel series. Bases quickly became my go-to spot for dozens of stories, an invaluable resource for research and gathering quotes and opinions about whatever comic book movie du jour Hollywood was about to unleash. Winding my way among the brightly colored racks, I’d pounce on unsuspecting browsers in hopes of scoring an interview. The shop also happened to be — and still is — a great place to spend time in, full of interesting, friendly and eccentric personalities. Owners Rob and Janice and manager James Preston are three of the most fun, welcoming people I’ve met. I have fond memories of chatting with them and their intelligent, opinionated customers about everything from Spider-Man, to the Man of Steel, to The Dark Knight, to San Diego Comic-Con, to Star Wars vs. Star Trek. If you’ve never visited your local comic book shop, I urge you to give it a try on Saturday. At best, you’ll discover a thrilling new series or rekindle your passion for a childhood favorite. Maybe you’ll meet some potential new friends with common interests. At worst, you’ll leave with a handful of free comics. Aside from Bases, Lancaster is home to two comic book shops. Battlegrounds carries a small selection of volumes, but specializes largely in tabletop gaming. My friends tell me that Horizon Comics offers great prices and selection. Each shop will have its own policy to determine how many comics you’ll receive on Free Comic Book Day, but you’re guaranteed at least one, as long as supplies last. Among the titles to be handed out are Doctor Who, Pokemon, Avengers, Transformers, Avatar, Street Fighter, Teen Titans Go!, The Tick and Teenage Mutant Ninja Turtles. 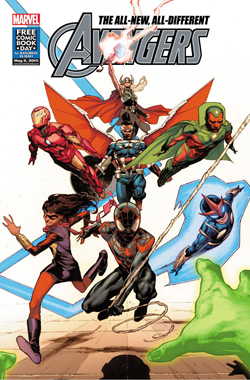 To find a participating comic book store near you, visit www.freecomicbookday.com. This entry was posted in Uncategorized and tagged comic book, comic book movies, comic book shop, comic book store, Free Comic Book Day on April 30, 2015 by Lavender Vroman.